The warm weather has finally showed up across Europe, and with that, comes the increased risk for heat-related illnesses. 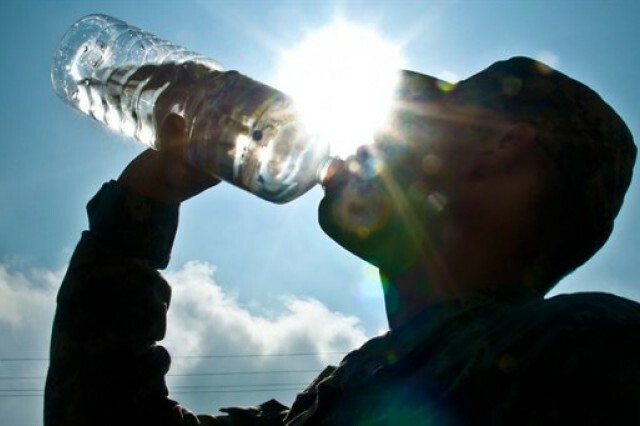 Last year, heat illnesses were responsible for more than 20 thousand lost or limited duty days. Heat-related illnesses, like heat exhaustion or heat stroke, result from the body not being able to properly cool itself. This year, across the European Region, there have already been a few cases of heat-related injuries. Stay safe this summer with these tips from Public Health Command Europe. PHCE recommends drinking enough water to replace what was lost through sweat. 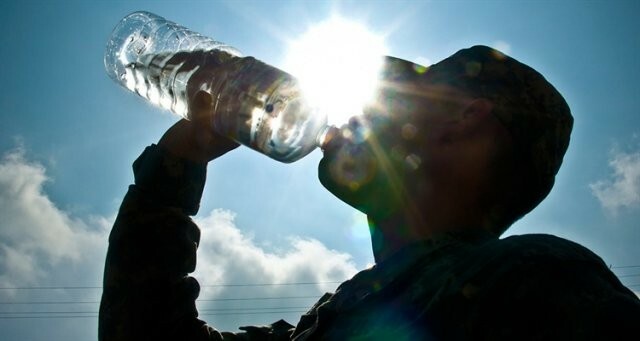 "Your body may need water before you feel thirsty so don't wait," Col. Rodney Coldren, PHCE Chief of Preventive Medicine Services said. "Drink water throughout the day. Urine color, or lack of urine, can tell a person a lot about their level of hydration." Lack of urination or dark-colored urine is an indication to drink more water. A good target is a quart an hour under most conditions. In addition to drinking water, PHCE also recommends eating meals which will help replace lost salts. It is also important to try and stay cool. Do this through wearing the appropriate clothing, choose lightweight, light-colored and loose-fitting clothing. When scheduling outdoor events, try to limit them to when it will be the coolest -- either in the morning or afternoon, PHCE recommends. "If you are going to be outside, make sure to take regular breaks in the shade," Coldren said. "This will help the body recover from the heat." Additionally, before heading outside, it is important to apply sunscreen. Lt. Col. Layne Green, LRMC Chief of Dermatology, said that in order to ensure optimal protection, sunscreen should be reapplied, on average, about every 80 minutes and each person should use about a shot-glass worth each application. Heat-related illnesses are preventable. PHCE recommends learning the signs of a heat-related illness and what to do. According to the CDC, a person who is suffering from a heat stroke may have hot, red, dry or damp skin; a fast, strong pulse; headache; dizziness; confusion; or they may lose consciousness. "If you suspect a heat stroke, call emergency services right away," Coldren said. "While you wait for help, move the person to a cooler place and start trying to lower their body temperature with cool cloths or a cool bath." Heat exhaustion is less severe, but has many of the same symptoms which can include heavy sweating, muscle cramps and tiredness or weakness. The CDC recommends moving to a cool place, loosening clothes, sipping water and placing cool cloths on your body if you experience these symptoms. "With heat exhaustion, we recommend getting medical help right away if the person is vomiting, the symptoms are not improving or they last longer than an hour," Coldren said. 1. Never leave a pet in a parked car, even with air conditioning on or windows opened or cracked. 2. If a pet is outside during hours of light, ensure they have shade to be out of direct sun and that they have fresh cool water at all times. 3. Remember, German or other host nation Laws for pets are often different than the typical laws in the U.S. and must be followed even on-post. 4. Any brachecephalic (pug faced animals, i.e.-pugs, French or America bulldogs) are at higher risk for heat related problems because they cannot dissipate heat as easily or efficiently when panting. 5. If you feel hot it's the same for your pet. For example, long walks or runs in the middle, hottest part of the day are the most dangerous times for heat related illness. "If you think your pet overheated see a vet immediately. Heat illness can be up to fatal for human and pets alike," DeVanna added.